Selqet is an 85’ Pacific Mariner with a hull design by the world renowned Bill Garden. His designs deliver great performance, excellent fuel efficiency and access to numerous destinations thanks to her shallow draft. She recently underwent an extensive bottom service including new paint, stabilizer service, reconditioned props and hull wax. Selqet offers spacious accommodations in four en-suite staterooms. The full beammaster suite features a separate private entry and large master bath with separate tub and shower.The separate crew quarters and kitchenette facility are located aft and offers sleeping arrangements for up to three crew.Selqet is a must see for any buyer interested in a motor yacht in the 85’ range. United Yacht Sales New Jersey would love to guide you through a personal showing of this 85' Pacific Mariner Rph My 2006. 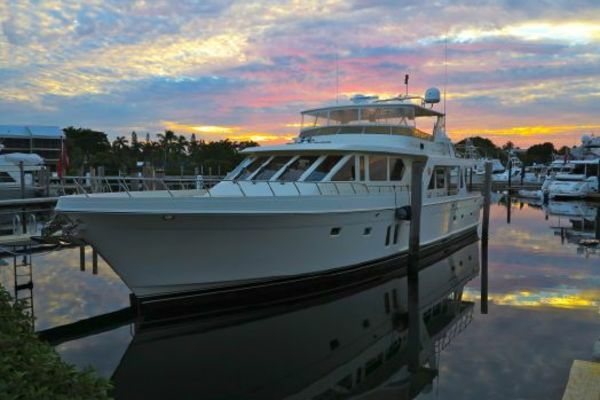 This yacht for sale is located in Unknown Bahamas and priced at $2,695,000. For a showing please contact us by filling out the form on this page and we will get back to you shortly! Entering the main Salon from the huge Teak covered Aft Deck area thru the stainless steel sliding glass door one can immediately appreciate the warm and inviting feeling of the open and spacious layout. The satin finish Mahogany wood interior blends in nicely with the tan colored carpet and off-­white overhead liner. There is an oversized "L­-shaped" sofa to port with two matching barrel & swivel chairs aft and a coffee table and a small table with lamp aft. Across to starboard are storage cabinets, the entertainment systems including a 50" television on a lift system and a "walk­-behind" wet bar forward. One remarkable feature of the main Salon/Dining area is the superb visibility thanks to the over-sized windows port & starboard and floor to ceiling. Located at mid­ship and being "full­-beam" the master suite of "Selqet" seems to belong to a much larger yacht! It offers a king size bed at center, two large hanging closets, a tremendous amount of drawers, a desk and book shelf to starboard and a "make-up" vanity to port. The four large stainless steel framed portholes bring in a great amount of sunshine. The indirect rope lighting, plush carpeting and over-sized flat screen television completes this great Master Suite. A unique feature on the 85' Pacific Mariner is the separate stairwell to the Master Suite and a full­-size stacked washer/dryer located in a cabinet forward at the bottom of the stairway landing area, just forward of the entrance to the Master Stateroom. The en-­suite Master Head is forward to port and features an "oval­-shaped" Jacuzzi tub and an over-sized frameless shower. The Mahogany wood vanity has two sinks, a marble countertop and mirrored medicine cabinet above. A large porthole allows for plenty of daylight and the floor is an "off ­white" marble inlay. Located all the way forward and accessed via the Pilothouse stairway, this guest cabin consists of a center-line queen berth. Like all staterooms, there is abundant cedar-­lined hanging space and drawers as wells as a private en-­suite head with frameless large shower. This forward cabin has an exceptional amount of daylight with two large portholes and the overhead escape hatch with privacy/screen sliders. As of all cabins, there is a flat screen TV and stereo. Being accessed via the Pilothouse, this portside midship stateroom offers twin berths and a complete en-­suite head with separate shower. Large hanging locker, ample storage, drawers, flat screen TV and stereo. The Crew Quarters and Engine Room are accessed from the Swim Platform via the transom door. The Captain's Stateroom is to starboard and features a double berth, hanging locker, a large porthole, storage drawers and private access to the head compartment forward. Across to port is the Crew's Lounge featuring a "kitchenette" with sink, microwave oven, refrigerator, over-sized freezer, flatscreen TV and stereo. There is a large settee all the way top that converts in to anadditional bunk. The flybridge can be accessed from the Galley/Pilothouse area or from the Aft Deck. There is an "L­-shaped" seating with a triangular table forward to starboard with storage underneath. Across to port is the "walk­-behind" wet bar and electric BBQ grill. There are three Stidd chairs forward with a large console at center that houses all necessary navigational equipment.Hot tub was replaced by custom cabinetry and dual grill on Flybridge. The Engine Room is forward of the Crew Quarters via a watertight bulkhead door. This full-­beam walk-­in machinery room is well laid out. Twin generators, fuel tankage, watermaker, tool chest, hydraulic systems, black water sewage treatment plan; all are easily accessed for operation and maintenance. Simply put, a "mechanic's dream!" "Selqet" is a registered name and does not covey. Exclusions are to include but are not limited to, all owner's personal items. A detailed list of exclusions will be provided at the time of sale, upon written request.